A variety of different types of Viking ships existed, beyond the simple classifications of cargo ship and war ship discussed in the main article. Archaeological finds show a broad range of ship types, and the sagas use a number of different words to describe the different kind of ships. The distinctions between different types is not firm, nor are the different categories particularly distinct. The common elements among all Norse ships include: clinker construction; open to the elements with minimal decking; and a side rudder. Compared to warships, trading vessels tended to be rounder, with a higher freeboard, a deeper draft, fewer places for oars, and fixed masts, since they tended to be used primarily with sails. The size of ships was described as being a certain number of rúm (rooms). The ship's frame divided the length of the ship into spaces for pairs of rowers (one rower each on port and starboard sides). Thus the number of rúm describes the number of pairs of rowers. One would expect at least a one meter (three foot) spacing between rowers, so the number of rúm also gives a minimum dimension for the length of the ship. The distinction between a boat (bátur) and a ship (skip) was probably blurry. The vessel used to ferry people from one side to the other of a protected fjord no doubt differed significantly in size and robustness from the vessel used by traders to cross the open waters of the Atlantic while loaded with cargo. 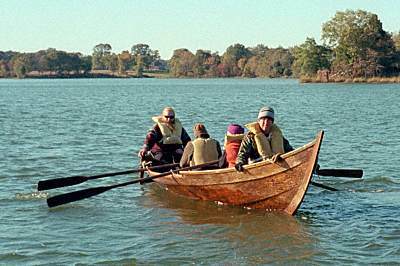 Bátur seems to refer to small boats, with fewer than six rúm, and thus fewer than six pairs of oars. Perhaps a convenient dividing line to distinguish boat from ship is 12m overall length (40ft), with considerable overlap on either side. The two boats shown to the right were found with the Gokstad ship. The closer boat has two pairs of oars and is about 6.5m (21ft) long overall, while the further boat has three pairs of oars and is about 9.7m (32ft) long. This replica boat, Gyrfalcon, is operated by the Longship Company. Like the smaller Gokstad boat, this boat has two pairs of oars. The boats are remarkably light and delicate, but apparently suited to their use. The Gokstad boats use oak planks and framing members, with pine floorboards. Like larger ships, they use a side rudder. Some boats show evidence of having been used with sails, but the Gokstad boats show no evidence of a sail. Instead, rowlocks pierced with a grommet hole (right) were attached inboard of the top strake. One wonders how boats were hired during this era. Gísla saga (ch.12) says that when Vésteinn wished to be ferried across Dýrafjörður, his kinswoman Lúta had men take him. Yet, in Kormáks saga (ch. 8) while Kormákur and his men were in pursuit, Bersi borrowed a boat from Þórveig to cross the fjord. In order to thwart Kormákur, Þórveig had the remaining boats damaged. When Kormákur arrived, he asked Þórveig for a boat. She said she didn't wish to give them one free of charge, but would let them use a wretched boat that she kept for hiring for half a mark. Kormákur accepted the bargain, but got only a short distance into the fjord before it filled with water. They barely got back to shore. Kormákur said Þórveig deserved punishment, not payment, but he paid her the agreed upon silver, regardless. Capsized boats apparently could be righted by a single individual while on the water. Egill rowed while Þormóður steered the boat across the fjord, as told in chapter 24 of Fóstbræðra saga. Þormóður intentionally capsized the boat and swam away. Egill climbed up on the keel of the boat. He looked around and concluded that Þormóður had drowned. Egill righted the boat and rowed back home. The byrðingur (cargo vessel) was short and broad, and meant primarily for coastal trade. The knörr was larger, with a wide-body and was the largest of the trading ships. Such ships were intended for ocean crossing voyages. The settlers of Iceland and the explorers of Vínland used knörrs, which could carry not only people, but also supplies, livestock, and cargo. The langskip (longship) was a general purpose word to describe any large warship of more than sixteen rúm. The sagas describe some very large langskips. King Óláf Tryggvasson's Long Serpent is described as having 34 rúm. In addition to her 68 rowers, the ship also had space for additional warriors. A karfi is a smaller warship usually owned by a king or great chieftan. The size clearly varied, with a range from six to sixteen rúm. The Gokstad ship (a 9th century ship recovered in the 19th century) is a karfi. The word dreki (dragon) also was used to describe a warship, but usually in the more imaginative and inventive sagas. The term refers to the dragon head attached to the prow (and occasionally the stern) of the ship, as shown to the right on the Íslendingur. A dreki probably had more than 30 rúm. A ferja (ferry) referred to a ship used for cargo and local transport. The general term kaupskip (trading ship) referred to any vessel used for trade. And the words skeið (light warship), skúta (light ship), and snekkja (swift warship) are used in sagas, although we have no information to make a distinction between any of them and more general warships.